One of the best reasons for choosing the Dryerbox as the recessed exhaust receptacle for your laundry room is the compatibility with gas-powered dryers. 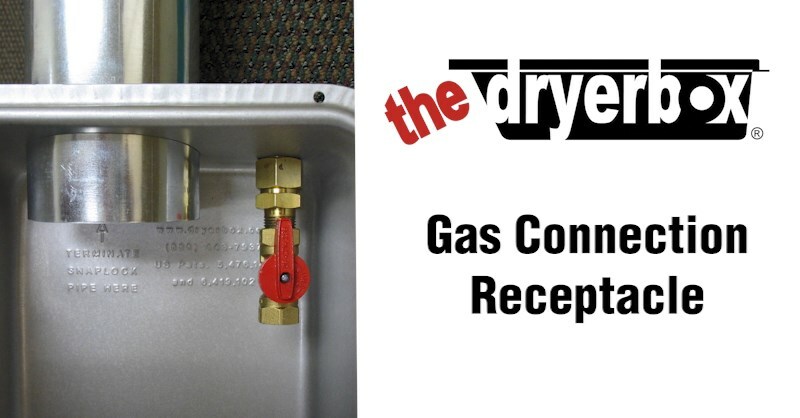 The Dryerbox doubles as a gas connection receptacle as well as the starting point for your dryer's duct connection. The Dryerbox® features a “knock-out” port for a gas line. With it, you’ll have a convenient and space saving location for the gas valve and termination fitting. The knock-out is 1 inch in diameter and supports 1/2” black iron pipe or a CSST Termination Fitting and Jamb nut to securely affix the termination to the receptacle. An approved ball style shut-off valve must be used. The installation of gas utilization equipment, related accessories, and their ventilation and venting systems should always be performed by qualified personnel. Visit the gas line termination page today for more information.